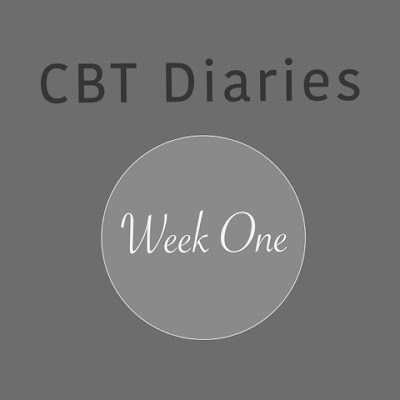 I've just got home from my first session of group work CBT (cognitive behavioural therapy) and I have decided that I want to document the process not only for myself but also for anyone else who is interested in the only therapy for anxiety and depression which is now offered by the NHS. If you go to your GP with symptoms of anxiety or depression, or both, then the likelihood is that you will be offered a course of CBT alongside some medication. This isn't my first experience of CBT, it's actually my third. Third time lucky I'm hoping. My past experiences with CBT haven't been that great and it's left me wondering if this 'one size fits all' therapy is the most appropriate course of action for me. During my first round of CBT my therapist was unfortunately very flakey and would often cancel my sessions at short notice. These one to one sessions were offered to me on a fortnightly basis so if I missed one appointment there would be a good months wait before the next one. I consequently found it difficult to gel with her and form a good working relationship so I stopped going and requested a change in therapist. As expected it took quite a while for another therapist to become available to see me so my wait for treatment continued. After already waiting three months to be seen by someone this was quite disheartening. That's another likelihood to be aware of if you are referred for CBT - a very long wait. With at least 1 in 4 people experiencing mental health difficulties every year it's no surprise that CBT is currently in very high demand. By the time I was allocated a second therapist I was pretty desperate for some professional input so I decided that I would persevere with my sessions regardless of any doubts that I might have had. Luckily my new CBT therapist was much more professional and pleasant to work with. This was two years ago now so I find it quite difficult to remember the sessions in full but I recall being challenged on some of my safety behaviours (i.e carrying a bottle of water and sick bag around with me, having to choose my seats on a plane/cinema etc.) and I was advised to refrain from listening to any negative thoughts which would then impact on my behaviour and how I was feeling. At the time I found it beneficial meeting with someone regularly to talk things through but I wasn't sure if the concept of CBT was really benefiting me in anyway. I still went on to experience both anxiety and panic attacks after completing six sessions, although there were periods where I felt more well than others. Wind the clock forward two years and here I am back at square one again. Well that's what it feels like anyway, but in reality I know that I have got more used to the illness and I am therefore able to cope better with it. The occasional Diazepam also helps. But the original issues still persist and as soon as I made the decision to come off my medication last year it resulted in another emotional crash which completely stopped me in my tracks. Life got turned upside down again and I felt as though history was repeating itself. The only thing worse than getting ill is getting ill again after having felt better. You've already been through it once and the thought of going through it again is pretty terrifying. I swiftly referred myself to a specialist via my GP last September. I became increasingly more fearful about the illness which appeared to be taking control of my life again and I wanted urgent help. As expected my GP informed me that it could be weeks before I was assessed which was the last thing I wanted to hear. The only option in the meantime was to start on another medication which I was really reluctant to do. Coming off my medication the year before felt like such a positive milestone in my recovery. The idea of taking it again and suffering the side effects and potentially gaining a whole load of weight was as depressing as the anxiety and depression. I was left with no option and I really couldn't carry on the way I was headed. After a few weeks I saw a Psychiatrist. I thought this was going to be the real step forward that I needed. I imagined weekly sessions with the Psychiatrist and them being someone who could finally help me solve all of my problems. Instead I was allocated a half hour appointment in which they purely just wanted to check how I was managing on the medication. Their role was to assess my progress and re-adjust my dosage accordingly. Rightly or wrongly I was expecting so much more than this. The only thing the Psychiatrist could do was refer me on to see a CBT therapist for an assessment to be considered for a group work programme. Not only was I really disheartened to hear the word CBT again but I was also feeling really let down that this wasn't even going to be on a one to one basis. In my mind I was to receive a lesser intense therapy than i'd received before so what good was this going to be to me!? I researched and discussed with my husband the option of going for private therapy. It was actually quite comforting knowing that this option was still there for me if I wanted it. In the end I decided that I had waited long enough already and that I may as well just start the NHS CBT course which was offered to me. I wanted to save the option of private therapy as a back up just in case this third round of CBT was again unsuccessful. Even today this is still a comforting thought. So, just to reflect, I originally referred myself for help on September 5th 2015 and today is 24th February 2016 and day one of the group CBT course. It's taken over 5 months to get from point A to point B. Even though I've been the one to live through that wait, it still shocks me to see it written down. 5 months! How is that even possible? In that 5 months my new medication has kicked in and helped me to feel much more stable. I'm not even sure if I would have been in the right headspace to receive the therapy straight away as I was so anxious and experiencing daily panic attacks. It would have been very challenging for me to attend anything at the time but I think 4-6 weeks after would have been ideal timing. Over the past few weeks i've been quite looking forward to starting the group work programme. Don't get me wrong, it would have never been my first choice and it certainly wasn't something that filled me with any kind of hope when it was initially mentioned to me. But i'm always open to trying new things and I think you have to be when suffering from any kind of emotional health problem. After all it's not like a broken leg, you can't put a plaster cast on and be fixed in a few weeks. Some people struggle their entire life with these kind of issues and i'm desperately hopeful that won't be the case for me. I've been looking forward to meeting other sufferers because, as horrible as it is, it's always quite comforting to meet other people who truly understand. My experience of mental illness is that the only people who ever really understand are the people who have sadly been in your shoes and experienced it for themselves. I've also been feeling pretty positive about the new CBT therapist who seems to be the best I have seen so far. I met her a couple of times prior to today for an assessment and she was really nice and caring. Anyway, I wasn't dreading attending today in the lead up to it which was a positive sign! When I arrived at the group this morning I suddenly felt pretty nervous. It's been a long time since i've sat in a room full of people in quite a formal setting and I definitely felt my hands become a bit clammy. All in all there were 10 of us in the room, 7 patients and 3 therapists. In the middle of the room there was a coffee table with plenty of refreshments available for everyone including some chocolate biscuits. As soon as people started talking I felt myself relax more and I even contributed towards the discussions which I didn't think would happen. Today's initial session was focused around problems and problem solving. We discussed some of the problems that we all face on a daily basis and potential solutions for solving them. Some people said that they find small tasks like answering the phone or opening their mail a challenge due to financial difficulties. Another said that they have to take Diazepam to be able to walk their dog once a day. Someone else commented that they find having to answer questions daily from friends/family problematic like "why are you feeling like this?" when they don't even know the answers themselves. It was a real eye opener into the variety of issues people with anxiety and depression face on a daily basis. It made me feel less alone and it also put into perspective my own problems. I think it would be fair to say that last year there was a short period of time where I struggled to leave the house due to anxiety but thankfully things are much better for me now and I am able to lead a relatively normal life. A lot of us felt that there aren't any solutions to the problems being talked about but as the discussion progressed and we broke it down into smaller pieces we began to understand that there can be small solutions to help i.e having people around us help us to do things or seeking advice and support from other services. It made me realise that in my own way I have already been doing this a lot of the time. For example, if I was to get invited somewhere I didn't feel comfortable about attending on my own I might ask my husband to drive me or maybe i'd ask a friend to come with me. I often feel anxious about using public transport but rather than avoid an event altogether I will find another way to get there which means that I can still attend. This is much better than missing out on something altogether. There was a lot of talk around defending ourselves against negative thoughts which can be hard at the best of times, let alone when you suffer with these illnesses. I think it's this aspect of CBT which I find the hardest. If my mind says to me "you don't feel up to doing that, just stay at home instead", I find it so hard to tell myself that i'll ultimately feel better for pushing myself and going against what my mind is telling me do. There is also a very fine balance between resting and taking care of yourself because you are unwell but also pushing yourself forward and outside of your comfort zone. I left the session today feeling like it was a really positive experience. I enjoyed being in a group dynamic and I feel that it actually suits my learning style better as I tend to remember things more if i've been listening to others stories. It was nice to meet other people and comforting to know that I am just one of many people experiencing what I do. It's only been one session and I can't say yet whether I think this will be the time to cure me of my problems but i'm presently optimistic and looking forward to what the next session has in store for me. Thanks for sharing Sarah. I think your response to the group session sounds positive and hopeful.